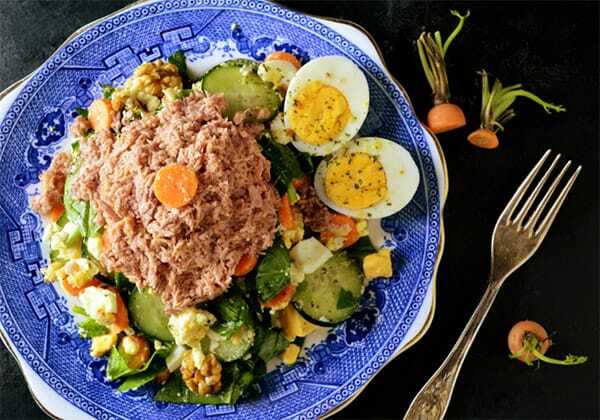 Classic tuna salad with a touch of Mediterranean-style cuisine is entirely new and crunchy flavour you will love. Its refreshing combination of fresh cucumbers, hard-boiled eggs, healthy spinach, unique goat’s cheese, and some nuts, with the smallest drizzle of lemon juice will show you why this beautiful salad is such a fantastic snack or dinner choice. Furthermore, the nutritional benefits of this healthy salad are simply mind-blowing. Enjoy it! Gently place eggs in the pot of boiling water. Cook for 12 minutes. Remove from the heat and drain. Chill to a room temperature and peel. Slcie one egg in half and chop the remaining two. Place on a serving plate. Add vegetables and season tih salt. Drizzle with lemon juice and top with tuna and the remaining egg. Serve immediately.